When I went into the old inner city of Utrecht on this late Saturday afternoon the sun was shining friendly. On my way to the very heart of the city, the Domplein with the remains of the majestic gothic cathedral – only the tower and the choir survived a tornado in 1674 – I passed the old court of justice, which is now partly a restaurant and partly the exhibition centre of the Utrecht Archives, Het Utrechts Archief. During the restoration of the former provincial court house and later city court many historic features of the building came into view again. The building was built on the grounds of the former Benedictine St. Paul’s abbey. In the fifties some parts of the church’ walls became visible, but now the main entrance of the refectory appeared to be still present. 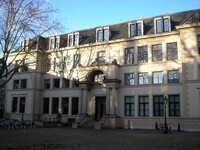 The nineteenth annual symposium of the Contactgroep Signum, an association for the social, economic and legal history of Dutch and Belgian medieval ecclesiastical and religious institutions, took place here on November 6, 2009. In the basement of the building you can visit the old cells in which prisoners were kept. On the header photo of my blog you can see the statue of Justice erected above the entrance in 1838 in commemoration of the new civil code, the revised Dutch version of the French Code Civil. As for the medieval city records, the records of the bishops, the cathedral chapter, the four (!) 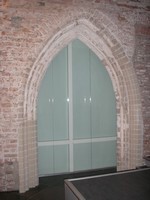 collegiate chapters of medieval Utrecht, the four parish churches and many monasteries, they remain safely housed in the purpose built archival depot at the Alexander Numankade. This entry was posted in Buildings and tagged Archives, Legal history, Netherlands on December 12, 2009 by rechtsgeschiedenis.